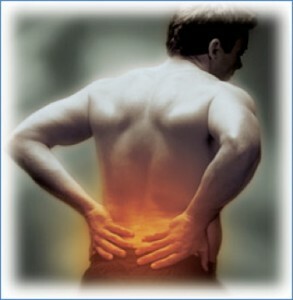 One of the most successful procedures in pain management today are epidural steroid injections. For pain that radiates down a person’s legs due to nerve root compression, they are the gold standard for pain relief. When a person is injured at work and develops sciatica, a workers compensation doctor who specializes in pain management can bring immense relief with epidural steroid injections. Epidural steroid injections have been performed since the 1960’s. Studies have consistently shown their beneficial effects between 75 and 90%. Typically they are given as a series of three injections one to two weeks apart. They can be repeated every few months if the pain comes back. It may take a full series with a Phoenix Injury Doctor to make sure the person can return to work effectively. Interlaminar Epidural Injections have been performed for over 50 years. Over the past 60 years, there has been a slight evolution in epidural injections to where there are now three different types. The main type of epidural injection is referred to as an interlaminar epidural. This was the initial method invented for the procedure, and it works so well it has persisted to this day. The pain doctor places the needle between the bones of the back of the spine, through the soft tissue overlying the spinal cord. Once the physician reaches the space surrounding the spinal cord (the epidural space), the steroid medication is injected. For decades, doctors performed these types of injections without fluoroscopy, which is a real time form of x-ray. A study in the 1990’s showed that without fluoroscopy doctors missed the epidural space 40% of the time, so now the usage of it is the standard around the country. Another method of performing epidural injections is with a caudal injection. This method involves placing a needle from the bottom of the spinal canal through a space known as the sacral hiatus. Once the needle is placed into the epidural space, a large amount of steroid medication is injected so that it will cover numerous spinal levels. Caudal Epidurals are performed through the bottom on the sacral region. pinched, a caudal injection works very well. The reason is that since it is a nondiscriminate injection method, the steroid is able to flow around multiple levels and provide pain relief. When it is focally injected such as with the interlaminar variety, the medication stays in the immediate area. 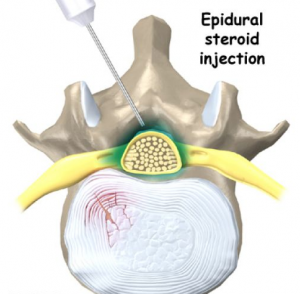 The newest variety of epidural steroid injections is termed a transforaminal epidural. With this injection, the pain doctor places the needle closer to the area where the nerve root is being pinched. As a nerve root leaves the spinal canal, it travels out a foramen (an opening). With a transforaminal variety of epidural, the needle is placed into the foramen in an effort to place the soothing steroid medication right around the area of compression rather than simply expecting it to gravitate there with an interlaminar injection. All three varieties of epidural steroid injections have shown to have good to excellent results for the treatment of nerve root compression and sciatica pain. When to perform each variety is up to one’s pain doctor and comes down to where the nerve root is being pinched, how many levels are involved, and the individual experience of the pain doctor and their training. Each type of injection maintains the same low risk profile, and all are performed as an outpatient. There is a reason epidural steroid injections have persisted as a popular procedure for over 50 years. And that is because they work well!